Giant Bicycle®, The Biking Solution, the Bikes Belong Coalition, and the Safe Routes to School National Partnership have jointly designed a special edition Cypress DX bicycle, the purchase of which will help fund initiatives that ensure that youngsters could safely walk or ride bikes to school. For every Special Edition Cypress DX sold through 28 participating Giant retailers, $20 will be donated to the Safe Routes to School. The promotion coincides with National Bike Month and Bike to Work Week, May 14th through 18th, 2007. The special edition bikes will be available through participating dealers after May 11th. During the past 35 years, the percentage of kids who bike or walk to school has dropped from 50% to less than 15%. 1 In communities nationwide, parents and teachers worry that students are at risk if they walk or bike to school through busy traffic. As a result, children are increasingly becoming less physically active. To address this issue, Giant Bicycle, The Biking Solution, and the Bikes Belong Coalition joined forces to promote this bike and accessory package promotion. This industry partnership encourages parents and students to leave their cars at home, and reduce traffic surrounding the school. According to statistics compiled by Safe Routes to School, 25% of morning traffic can be attributed to students traveling to school; additionally, the number of overweight schoolchildren has increased from 4 to 16% since 1963. 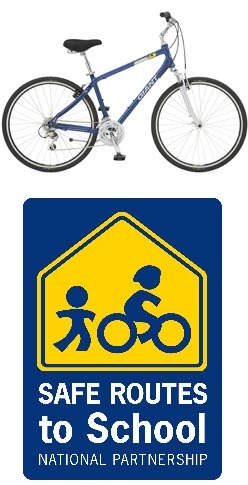 Launched in 2005, Safe Routes to School (www.saferoutespartnership.org) is a national movement promoting improved health, reduced traffic congestion, better air quality, and enhanced neighborhood safety. At its heart, the program empowers communities like Pomona to make walking and bicycling to school a safe and routine activity once again.